The modern classic effects processor gets a revamp - but was there anything to improve? 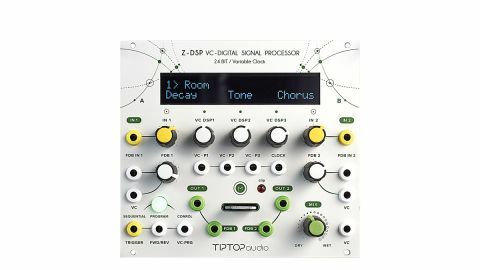 Tiptop missed doing something groundbreaking here; then again, the Z-DSP in itself is so well thought-out, it’s still a contender. True stereo in and out. Program and use your own effects or download free programs from the user library. Has a huge screen but doesn’t display much info. Software for creating your own cards only works on PC. Originally released in 2009, the Z-DSP effects module has become a Eurorack standard for top notch reverb, delays, and other effect processing. In 2018, to bring it in line with its new range, Tiptop has now relaunched the module in an updated version. For those who don’t know the original, the Z-DSP is a stereo-in, stereo-out effects processor with a range of different cards, each featuring eight programs. There are three main DSP controls with a large screen above to indicate which parameter the knobs affect. All the knobs have control voltage inputs, and under CV control the knobs act as offsets. An analogue feedback circuit feeds an amount of the output back into the input; this can be used to thicken up the sound, but if you push it hard, it will send the module into screaming self-oscillation. The feedback input also contains a VCA for modulation of the gain and a send/return for inserting other effects into the feedback loop. There are also three inputs for program switching in either direction via a trigger signal or continuous modulation. Some cards are designed to facilitate program switching while for others it may produce strange results - whether that’s good or bad depends on how experimental you want to get. With the old and new versions side by side, you notice how little has changed: apart from the slick new panel and the banana-style jack sockets, the only noticeable difference is the program change button which is now easier to push than the tiny square button of old. Out of the rack you can see that the new Z-DSP is now skiff friendly at less than half the depth of the original. Hardware changes are subtle rather than drastic. The digital side of the module is completely unchanged: all updates are to analogue circuitry. The main DSP still comes via the Spin-FV1, a chip used in several other Euro FX modules - back in 2013 users were already worrying about its longevity, as the chip designer sadly died before finishing an updated version. Whether, in 2018, it can still suffice, is a tough question to have to ask. So what’s changed? The new version is slightly louder than the old one, which improves the signal-to-noise ratio. Tiptop also claims improved sound quality with clearer high frequency. It certainly does sound slightly different at the same settings: depending on which were selected, we found either the old or the new to sound better at the time. There was no clear winner. It has fixed the 3dB gain drop in the centre of the mix control, and we’ll admit, we were sceptical when we first read about this. We’d never noticed an issue in that regard but when we A/Bed them the difference was very noticeable - as 50% is often where you want the mix set, in practice this is a major improvement. The new version also boasts lower noise and improved immunity to ripple from Eurorack power lines. Again this was not an issue we’ve experienced with the original so we didn’t notice any change here. The analogue feedback circuit has also been ‘improved’ to be more musical, meaning you can drive it harder before it goes into self oscillation. We were only sent two standard cards for review purposes and with these we actually preferred the feedback on the original. It starts to self-oscillate earlier but this gives you a bit more range at the extreme end of the feedback loop which we prefer. The Z-DSP’s clock input confuses a lot of people. Often mistaken as a sync input for delay times, if you connect a standard modular clock pulse here, the module will crash and you’ll have to power cycle your system - but don’t worry, you won’t have caused any damage. This input actually overrides the onboard clock that controls the DSP chip and the sample rate of the ADC/ DAC. It’s used to a 32kHz signal so the best thing to use is a Square or Pulse wave from an Oscillator set to its highest frequency. Once you have direct control of the chip, you can mess with it, reducing the fidelity in a similar way to a bit-crusher. Subtle drops in frequency roughen up the signal and add a little noise; serious frequency shifts or modulating the clock can produce all kinds of digital chaos and artefacts. Time to get grungy! The Z-DSP now ships with Halls of Valhalla reverb as well as the Dragonfly Delays MKII card that has always come as standard. The excellent Valhalla reverbs were what led us to buy a Z-DSP a few years ago, and this card hardly leaves ours - it just sounds fantastic. The three controls (Decay, Tone and Chorus) keep things simple while giving decent creative possibility. A pre-delay control would be useful, but as the Z-DSP only has three controls, there is sadly no space for it. The Dragonfly Delays offer five mono-in to stereo-out and three stereo-to-stereo delays of different flavours. It’s a no-frills set of pretty standard delays, but often that’s just what you need. The audio quality is very crisp but the feedback loop of the Z-DSP can be used with external effects such as distortion or filters to colour the repeats if required. Tiptop will release four new cards soon, and combined with the NumberZ interface that lets you write programs onto blank cards, you have a wealth of effect possibilities with this module. It’s no surprise that those who can afford it often have several Z-DSPs in their system so they can run a few cards at once. Having two Z-DSPs during the review, it was great to be able to run the Dragonfly Delays into the Valhalla Reverbs for extra stereo lushness.